Jumble Sale in St Catherine’s Hall on Saturday 28th May, opening 2:00pm. 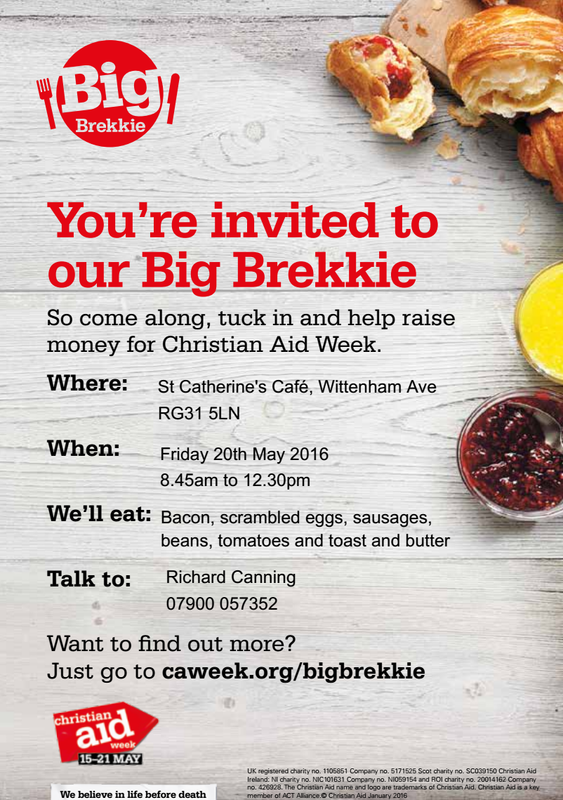 You’re invited to our Big Brekkie to raise money for Christian Aid Week. Please join us for Bacon, Scrambled Eggs, Sausages, Beans, Tomatoes and Toast & Butter on Friday 20th May from 8:45 am to 12.30 pm. Pentecost is Sunday 15th May, and to celebrate we will be holding a special united joint service at St Catherine’s, starting at 10:30am. The Cornwell and St Catherine’s congregations will be joining together in an All Age service with Communion. Our next Messy Church is this coming Saturday – 7th May. Our theme is “St Catherine”, not least because our development project was opened on St Catherine’s Day – April 29th. It will be our usual mix of Fun, Faith and Food, so please join us on the first Saturday of the month, starting at 3:30pm. St Catherine’s Café will be open during Election Day on Thursday May 5th. We hope to serve tea and coffee during the day with a light lunch including soup and cake.